Developmentally he’s great. He’s dodged a lot of bullets given how many surgeries and cardiac intensive care unit stays he’s had. He’s smart and funny, and he’s even learning how to eat, though it’s a slow process. It’s hard to gain weight when you eat one rice grain at a time. 30 chews each. But we’re getting there. 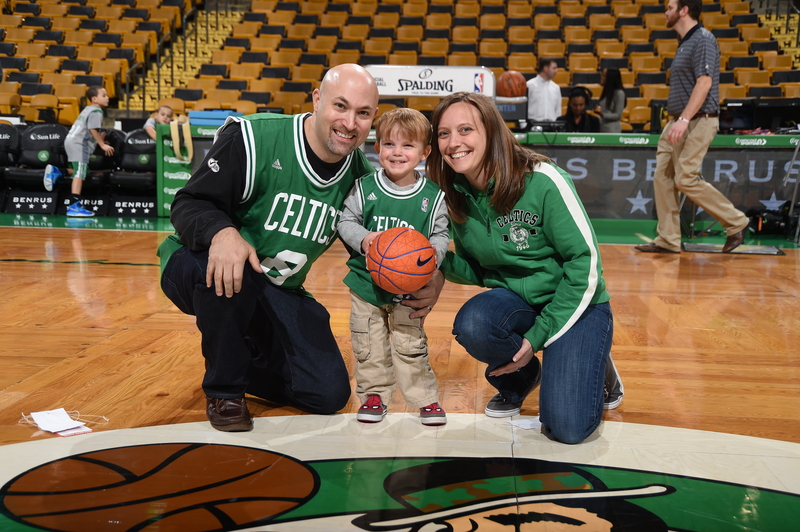 Back to sports, a few weeks ago we took Ari to his first Celtics game. How many 2 year old kids do you know that will sit still for 3 hours and watch a game? Ari did. And he did play-by-play the whole time. He got a little special treatment, too. This letter – currently on it’s way to the Celtics office – will give you the idea. Our almost 3-year-old son Ari was born with a very serious congenital heart defect. He’s the only person in the world to have had 2 heart surgeries before he was born. Since then he’s had 3 major open-heart surgeries to replace 3 of the 4 valves in his heart, and cut severe scar tissue out of his left ventricle. He’s also now had 7 cardiac catheterizations. From a cardiac perspective, he’s not in the best shape, but as a little boy he’s smart, funny, and happy. He happens to be addicted to basketball. So much so, that he can’t sleep without his ball next to his pillow. He shoots baskets in the living room for 10 hours straight, referring to himself as Jeff Green. He knows all the players and their numbers, and talks about little else. Imagine a 3-year old’s impression of Mike Gorman, “Jeff Green for 3… Got it!” This is our constant living room sound track. A few weeks ago we took Ari to his first Celtics game. It was a truly magical experience for him, my wife, Erica, and me due to the efforts and kindness of Tristan Lenhart, the graciousness of all the Celtics players and coaches, and the fabulous staff at the Garden. Tristan organized special access for us, meeting us at 11 a.m. for the recent 1 p.m. game with the Wizards. He took us down to watch shoot around, and get our picture taken at half court. While he didn’t disturb the players, he showed us where to stand should the players stop on their own to sign autographs. It was surprising that not only did many of the players and coaches stop for autographs, they did so with rare graciousness and kindness. Tyler Zeller, Walter McCarty, and Brian Scalabrine signed his shirt. Rajon Rondo stopped to sign his ball and take a picture. Phil Pressey gave Ari his wrist band. The security staff allowed Ari to go down to the walkway to get fist bumps from the players and coaches as they left the game. We bumped into Cindy Brennan from the Shamrock Foundation. She brought us down behind the Wizards bench to get Ari a close up look at his other idol, Paul Pierce. (We can have Paul sign Ari’s shirt in a few years when Paul is on the front office staff.) Of course, we thank Tristan who gave us special access and chaperoned us for the better part of the morning. And Ari’s hero and heart brother, Jeff Green, paused for a picture with us. Ari will have these pictures, shirt, and ball forever. In my experience, this kind of true professionalism is not happenstance. It’s cultural. As lifelong fans and many year season ticket holder (until we had Ari and his often high maintenance special needs), it’s great to know the team that we love is also a great organization. You all made a special little boy very happy. He wasn’t the only one who had fun. It was a magical day, indeed. You probably saw in there that he’s not in the best cardiac shape. At best, we don’t know what shape he’s in. At his last echo a few weeks ago, we learned that he wasn’t making the kind of improvements that we’d hope for since the last surgery and cath. His old nemesis, pulmonary hypertension, is not improving. He’s at two-thirds systemic pressure. For those of you who aren’t cardiologists, it means his heart and lungs are under way more pressure than a normal person. We don’t know when, but unless it gets better (which it’s not right now), it could get bad. Like no options bad. Sometime this month we’ll be meeting with Ari’s whole cardiac team at the hospital and talk about whether there are options. Short of a heart transplant, with the surgery and cath we played the last cards in our hands. At least the last cards that we know about, and that the doctors talked about thus far. Here’s hoping when we have our meeting we can all figure something out. Or maybe Ari will just stop being fresh and get better on his own. What a great update. Remember, the cards are being developed as we breathe. There is a positive outcome for Ari. Also remember, I am always available for you, ‘tho your support system does stretch on forever. With prayers for Ari, and you…. Love to hear stories of this amazing boy. Sending prayers and light to him and this family. God is always with him. What wonderful memory making! My prayers are with Ari and all of you. Lots of love. We have been sending a lot of positive thoughts his way and yours. Love seeing his huge smile. Will be sending prayers for healing in the new year. I am and will be praying for Ari. He is truly a very special child with real purpose. I pray for a day 15 years from now when he and Benjamin can hang out at Stowecation together moving from sports court to boating. Love too each of you. I am glad you are chasing Ari’s dreams for him. I think the real honor is the Celtics got to meet Ari. 🙂 I will continue to think of and pray for him. I will continue to keep you and your family in my thoughts and prayers. Thank you so much for sharing your story and your life with us. You and your family are truly an inspiration to all of us. Continuing to pray for that awesome superstar Ari!!! So happy you all had this awesome experience. Loved seeing all your pictures!! Pure happiness is oozing from every one! Hope you had a great Christmas & Happy New Year! We are always praying for Ari. Ari the amazing master of ball handling and sports enthusiast! So inspirational and very determined! ALL of his teams are cheering for him!